It is clear from the comments attracted by my last couple of posts that the Derriford hospital bus stop is very much a special case. Well, at least it should be. Apparently the second busiest bus stop outside of Royal Parade it is actually very well served by Citybus, First and Target and even DAC coaches seem to still have a service here. Add to this the new Northern Connect services due to start next month and you can really appreciate just how busy this bus stop is. Bus stop congestion is a major issue here with buses often having to queue up to get through. Even without thoughtless cars and taxis stopping at the drop off zone at the entrance to the bus stop area it can be chaos here. Stand here at 4.30 on a weekday evening and be amazed at the activity! Severe traffic congestion in and out of the site must make this a nightmare for bus companies striving to ensure buses run close to timetable. FDC recently 'improved' their Tavistock services by reducing the number of buses coming into the hospital. By not coming into the hospital it can save at least 10 minutes at peak times. So we know its not good for the bus companies so what about for the passengers. Well to be honest its a disaster! The bus stop shelters are not awful to say the least. There is one large shelter and another half baked shelter for the North and Eastbound routes. There are a few seats around so thats not a problem. The big problem with the bus stops here is trying to work out which stop to use for your service. Most passengers wont appreciate the finer details of Eastbound, Northbound, South bound and Westbound routes. If you want a bus to town it could stop at any of the stops. When it gets really busy it is easy to miss your bus because it has stopped at a different stop to where you are waiting and you just dont see it. 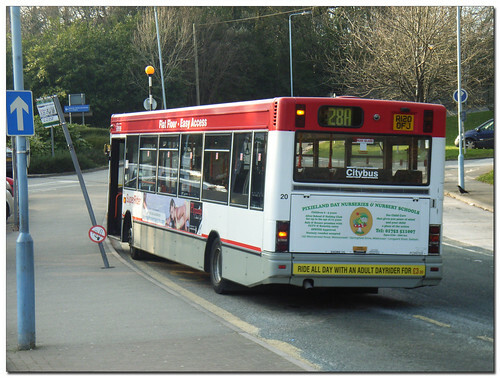 Many drivers still seem to struggle to know which stop to use (both companies) and because the stop flags are out of date its not much help looking at them either. I have covered the issue of the timetables displayed here in the previous posts but I will mention again the large bus route map - from 2005 still on display! The other big issue we have here is evident at the busier times of day. Once a driver has closed his doors and pulled away from the bus stop they are not allowed to let passengers on. This is a basic health and safety issue for obvious reasons. The problem at Derriford is the bus will pull out into the traffic and then stop in the queue to get out. Passengers will then hurl abuse at the driver for not letting them on! Of course some drivers give in and do let people on but this is risky because it will just take one accident and all hell will let loose! Derriford is crying out for a big improvement in its bus stop area. It desperately needs Real Time Information displays at least. This one improvement alone will make a big difference. I know that there are big plans for the whole remodelling of the entrance area for Derriford Hospital and that this is probably the reason that there has been no investment here. These changes though wont take place for a few years yet. Can passengers and bus operators really wait that long before something gets sorted? The -bounds used to make sense when there was a huge sign mounted on the shelter explaining the routes. Now it's just nominally North/East, West/South, City Direct. They should do the Derriford Hospital Bus Stops the same way they are in the Bus Station. On one side they have "BUS STOP" Sign and Service Numbers from this stop,and on the other side the Areas served by theses buses.